﻿ "Ek Ladki Ko Dekha Toh Aisa Laga" says a self-conscious yet warm hello to change! Tusshar Sasi	 February 3, 2019	 Leave a Comment on “Ek Ladki Ko Dekha Toh Aisa Laga” says a self-conscious yet warm hello to change! “Why would anyone like a story like this?”, quips Balbir Chaudhary (Anil Kapoor) upon hearing the plot of the play that he is supposed to be acting in. As his mother had rightly stated a few minutes before, stories cannot get cornier when they are about two lovers, parental opposition (siyappa, as they choose to call it) and an inevitable happy ending. That is when debutant filmmaker Shelly Chopra Dhar’s Ek Ladki Ko Dekha Toh Aisa Laga decides to bring in a challenging twist in the tale – the lovers belong to the same gender. Designed in a very familiar Punjabi family setup, here comes a film that is decidedly in the classic Bollywood space, complete with designer clothes, peppy dance numbers, winsome comedic subplots, lush locales and the works. 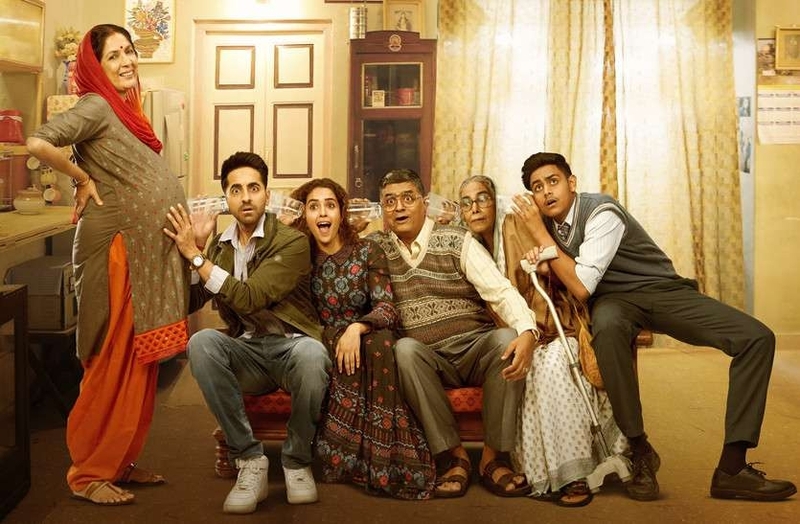 Still, it is not the regular Hindi family drama that you comfortably dissect as you ride back home with your parents who might just be the flagbearers of progressive ideas in a handful of Whatsapp groups. Coming back to the film, Ek Ladki Ko Dekha to Aisa Laga is pretty elementary in aspirations if we set aside its central crisis (I dare call it one). The film presents to us a bunch of people who cultivate dreams – one of a vocation (cooking), another of a passion (acting) and the main protagonist wants to openly embrace her sexual preference. While the film innocently equates the concept of sexuality with the first two, it cannot be ignored that they are all victims who adhered to certain societal norms, with impacts of varying degrees. Balbir Chaudhary loves to cook but is constantly reprimanded by his mother (Madhumalti Kapoor) from indulging in it as she believes that the kitchen is supposed to be a woman’s territory. One of the film’s key elements is a playwright Sahil Mirza (Rajkummar Rao) who is on the lookout for the right subject for his play whereas his rich, film producer father does not have much confidence in his skills. The film also sees Chhatro (Juhi Chawla), a caterer with acting dreams in her eyes who proudly flaunts her degree from ‘Amrinder School of Acting and Emotions’. Chhatro, too, gets a momentous backstory which is explained in a whiff. Now, these are all spunky characters with unique quirks, belief systems, aspirations and carefully crafted conflicts. They do not make sense in totality but are designed so as to converge uniformly as the protagonist is eventually served justice. Playing the titular character, Sweety (a restrained Sonam K Ahuja) is a shy, submissive Punjabi girl who swings the other way (which is no more a spoiler). Bizarrely enough, with all the context-setting in place, the least that the film cares about is in establishing Sweety’s controversial romance with Kuhu (Regina Cassandra), whom she meets briefly at a wedding. The only person who is aware of their liaison is her high-on-testosterone sibling, Bablu (an impressive Abhishek Duhan). Their story trajectory begins and ends right there and disappointingly so. Yes, it is evident how the film wants to remain in the family drama zone but how about setting a concrete foundation to a relationship that is supposed to shake every inhabitant in the film’s intimate setting? Instead what Ek Ladki Ko Dekha Toh Aisa Laga chooses is to deliver speeches after speeches on why we – as a society – need to be accepting towards all kinds of love. While it doesn’t make the cut as a prototype of exemplary screenwriting or filmmaking, we realize that it is perhaps an attempt to reach the grassroots a la political propaganda films from yore. In the process, their story as a cause ends up getting a fair deal whereas the lovers’ chemistry seldom blooms. The film also does not miss an opportunity to assess the scenario with a probable inter-religion affair between Sweety and Sahil. The angle gets a half-baked conclusion but it cannot be denied that its integration makes for a quick, relatable comparison. Coming to the film’s brighter aspects, there is a charming supporting cast that lends a great deal of charm to Ek Ladki Ko Dekha Toh Aisa Laga. It is extremely gimmicky but we can’t resist blushing when Juhi Chawla and Anil Kapoor evoke nostalgia with their syrupy middle-age romance. Their chemistry is perhaps the film’s most delightful component – so much so that your heart skips a beat when the two fabulous players get together. You also see Seema Pahwa and Brijendra Kala owning their tiny parts as domestic helpers in ways that only they can. Rajkummar Rao’s Sahil Mirza might appear to be a forced catalyst in Sweety’s perplexing world but the film makes sure to lend him his share of victories, albeit simplistic. The core of Ek Ladki Ko Dekha Toh Aisa Laga is the titular play that Sahil conceives. The episode is one where the film’s intent completely overshadows its actual emotional core – of a family, of two individuals in love. It becomes preachy and nearly an awareness campaign. This imminently charters Ek Ladki Ko Dekha Toh Aisa Laga into the self-help arena. The screenplay by Gazal Dhaliwal and Shelly Chopra Dhar is markedly tell-tale and one-dimensional. To assert the message further, the writers chronicle Sweety’s lonely childhood with multiple diary entries and paintings around her sexuality. One can easily empathize with the writers wanting to express their frustrations through a possibly personal story but the framework that they got to work on, unfortunately, is limiting. As sad as it might sound, the brief on the table was perhaps to obtain a story template that would not offend the primary target group – the heterosexual audience. That said, following the landmark Supreme Court verdict that ended the barbaric section 377 in Indian Penal Code, it is near-impossible to contain the excitement of having a mainstream film address the concept of same-gender relationships. Director Dhar covers up few of the aforementioned shaky angles in her screenplay with a message that is powerful enough and delivered via actors who most certainly know their goods. The melodrama quotient finds the right balance as the film breezes through its teary final act. Over-simplified, the film certainly is. Then we know that Ek Ladki Ko Dekha Toh Aisa Laga is more of a precursor to what can go on to usher in a potent revolution in Indian cinema. Until then, this flawed yet sweet and well-intentioned family drama needs to be showered with dollops of love for its very existence. Previous Post“Mary Queen of Scots” might be forcefully woke but is refreshing in parts! Next Post“Kumbalangi Nights”… A sharply observed film that marks a sublime directorial debut!